I have a thing for Japanese drinks. I love how the Japanese market puts out drinks for every occasion, most probably due to the fact that there are one or five vending machines on each street corner. The prolific nature of vending machines and the Japanese penchant for celebrating the little things means that drink companies can and do make drinks for every occasion under the sun (and moon). Sakura are blooming – there are several limited edition drinks to celebrate. First leaves of the fall changing color? There are drinks to celebrate that too! Fresh snow falling? Well, you get the idea. 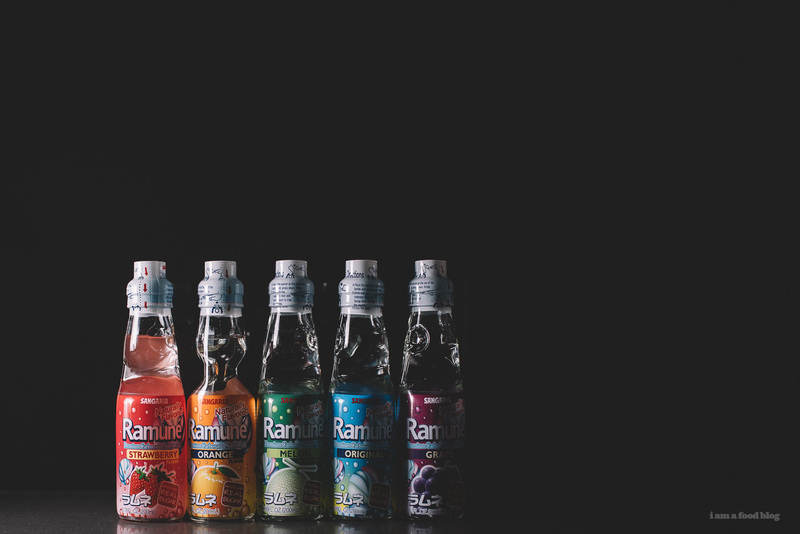 There are so many quirky drinks out there but one of my favorites is the classic ramune. Ramune is a lemonade-ish soda that is sweet, refreshing, and incredibly fun because of its unique bottle design. They come in codd-neck bottles: glass bottles sealed with a marble to keep the fizziness in. To open them, there’s a little piece of plastic that you use to push the marble down. It’s kind of like an experience drink. You don’t just drink it – you need to open it in a fancy kind of way, which makes it just that much more out of the ordinary. The first time I had ramune wasn’t in Japan. I ordered it at a Japanese izakaya because it seemed like it was the thing to do. I saw a bunch of other tables popping open their bottles and I had to have one too. Luckily the server opened my bottle for me because, to be honest, I had no idea how to do it. I’ve had a lot of practice since then though – I am now an expert ramune bottle opener! In Japan, ramune is found everywhere, but it’s also a classically nostalgic summertime drink. If you go to any summer festival you’ll find ramune in icy buckets. And if you’re at a festival, you know there’s going to be festival food. 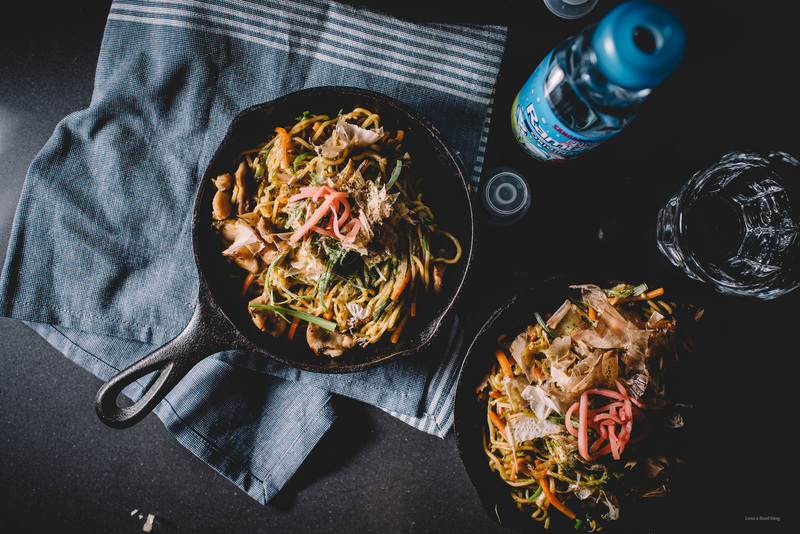 Summer isn’t here yet, but I’m getting into those summer festival feels with a little ramune and yakisoba action. 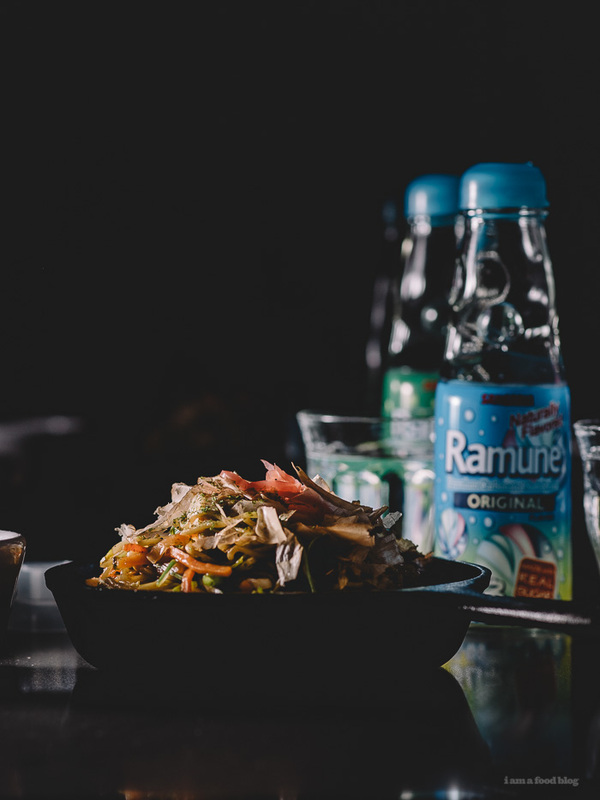 Ramune and yakisoba together remind me of long summer nights, festivals, good food, and good times. I absolutely cannot wait until summer arrives. Until then, I’ll be stuffing my face with chicken yakisoba and washing it down with ice cold bottles of ramune. 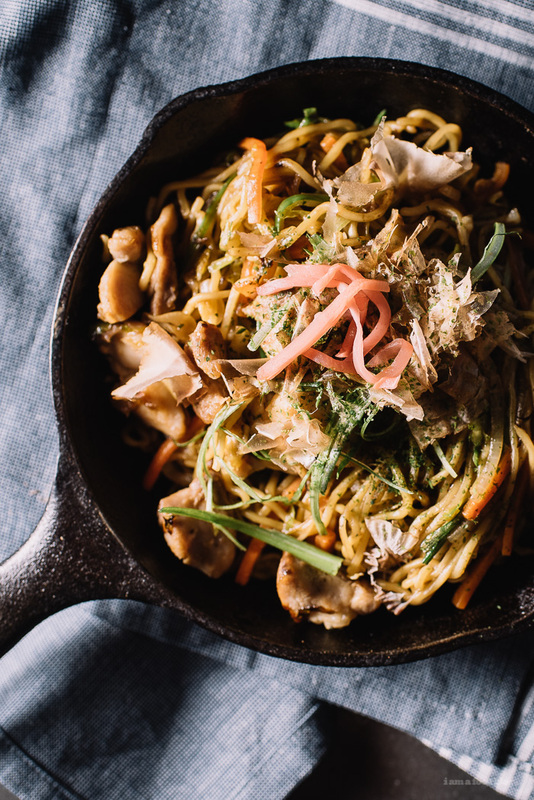 Contrary to the name, yakisoba is not actually made with soba noodles. 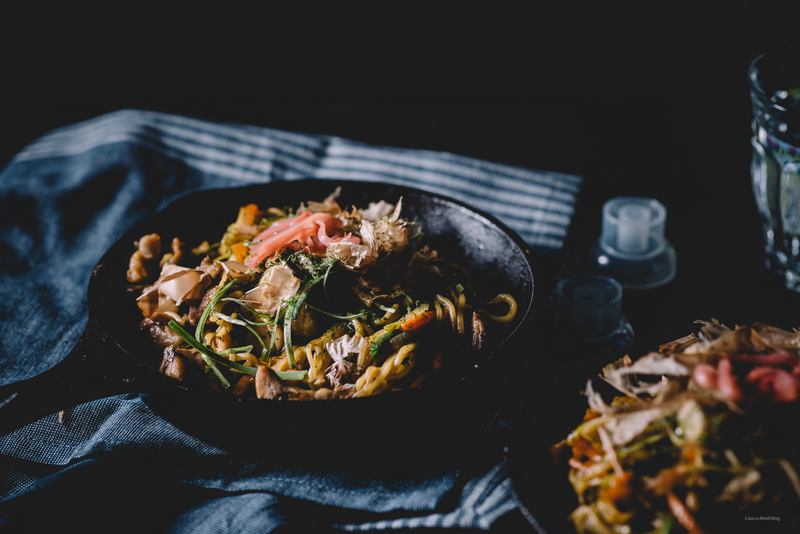 Yakisoba literally means fried noodles, with yaki meaning fried and soba meaning noodles. 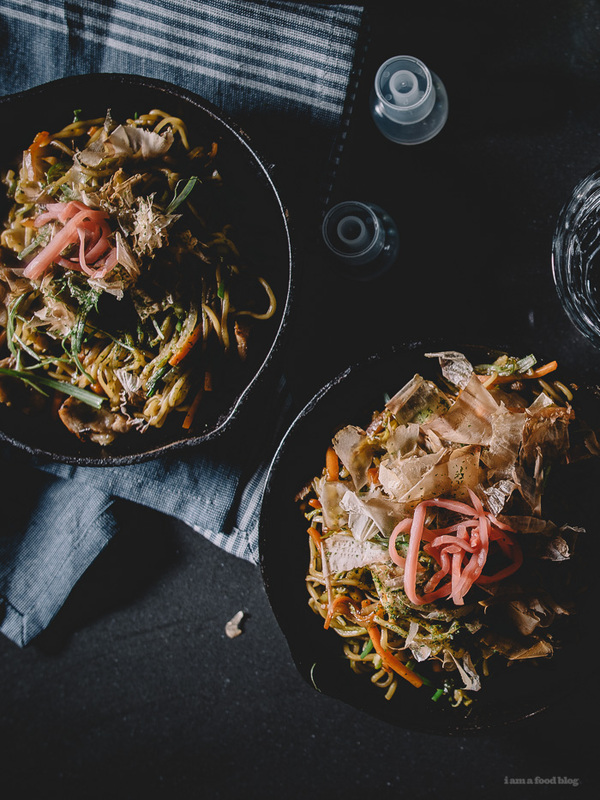 It’s a Japanese take on Chinese chow mein and is typically made with fresh ramen noodles. Sometimes you can find noodles labeled “yakisoba” at the store. 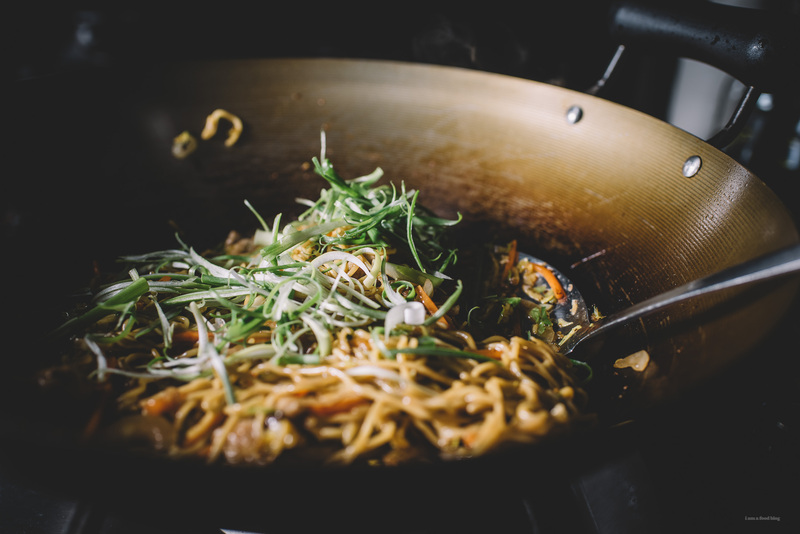 You can also use fresh ramen noodles or fresh Chinese egg noodles. Mix together the worcester, oyster sauce, ketchup, soy sauce, mirin, and white pepper in a small bowl. Set aside. Loosen the noodles, placing in a bowl of hot tap water and swishing back and forth, if needed. 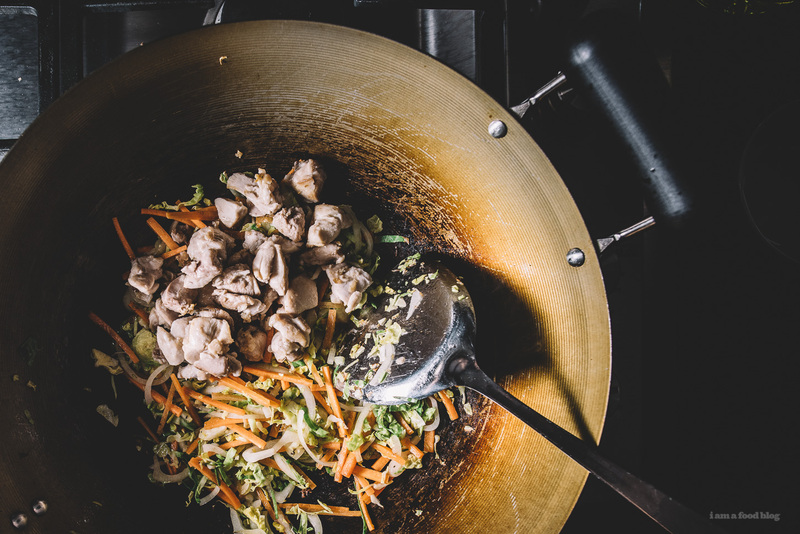 Heat up a touch of oil over medium-high heat in a large frying skillet or wok. Add the chicken pieces and cook, stirring occasionally, until browned and cooked through, 5-7 minutes. Remove from the pan and set aside. If the pan is dry add a bit more oil. Turn the heat to medium and add the onions and cook, stirring, until soft, but not brown. Add the carrot and sliced brussel sprouts, stir, and cook for 1-2 minutes. 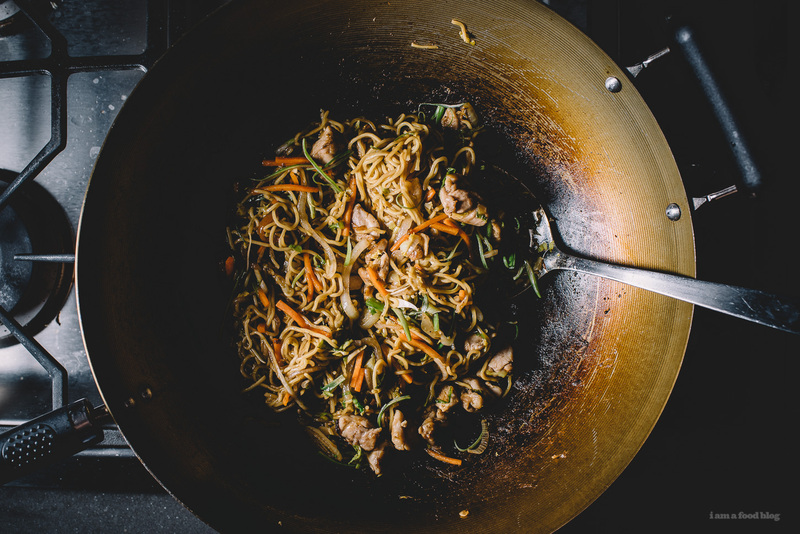 Add the chicken and loosened noodles into the pan and toss to mix. Pour in the sauce, stir and fry for 1-2 minutes making sure everything is evenly coated. Enjoy hot with katsuobushi, aonori, and beni shoga! Notes: The worcester sauce used in this recipe is Japanese worcester, which is thicker and sweeter. Katsuobushi is dried bonito flakes, aonori are seaweed flakes, and beni shoga is pickled ginger. This post was sponsored by Sangaria. Hope you try some ramune! Thanks for supporting I am a Food Blog! Ah, yakisoba! this looks delicious! I can’t wait to make this! Looks delicious and healthy. My friend just sent my kids 2 bottles of Ramune just for fun and they LOVED it. Mostly they loved opening it, but they downed the soda too. This yakisoba looks awesome BTW. So my fresh ramen noodles totally clumped up as soon as I drained them from the hot water and turned into a slimy inedible mess. What did I do wrong? how long did you cook the noodles for? it could be the kind of ramen noodles you used – which brand was it? there are actually noodles labeled “yakisoba” at asian grocery stores that you can purchase, which would work perfectly. you can also sub in any sort of fresh asian noodle that you have tried and liked. i can let you know some brands that work well if you like. let me know! 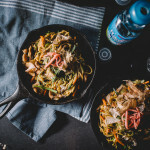 Any thoughts on how to use frozen yakisoba noodles for making this? Looks like they’ve been cooked already, and frozen.